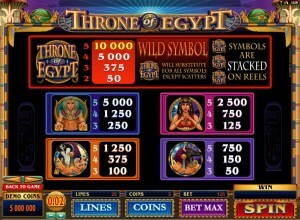 Throne of Egypt tells you exactly what kind of theme it offers you. 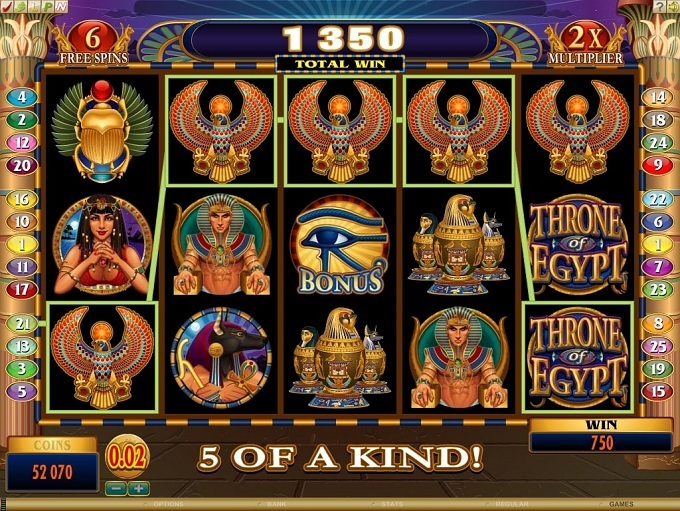 Ancient Egypt has served as inspiration to countless slot machines, and even Microgaming has a few others with the same topic. The design in this case is considerably better than in most of these games though. You’re going to find a slot where the visuals matter and which uses features as well to give you a pleasant experience. You will get 5 reels and as many as 25 active lines each round. 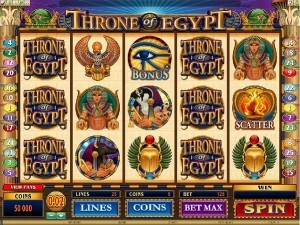 The slot’s bonus games, scatter symbols, free spins, stacked wilds and multipliers will make sure you have a good time. The top prize will reward you with up to $10,000. The game is not only generous with its looks, it’s also the kind of game that tries to give you something different when it comes to features, actually having an interesting bonus which makes it unique, not just wilds and scatters. 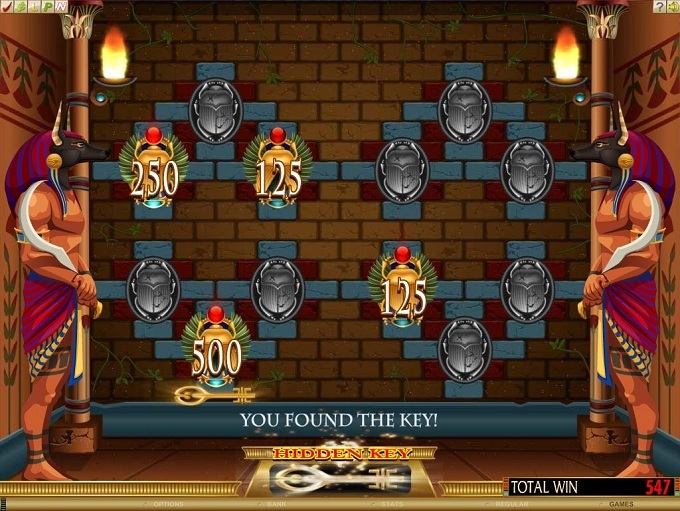 The wild symbols come in stacked, plus there are scatters which trigger free spins that have multipliers. The stacked wild is a big part of the slot, being capable of offering you combinations which wouldn’t have formed without it being present. Since it comes in stacked, there are more paylines that benefit from the wild’s presence. The wild is capable of forming its own combos of two to five symbols, plus since it’s stacked there are good odds that you will get multiple payouts from it at the same time. Up to 10,000x can be offered by a single combo formed with wilds. The scatter symbol has the image of the Fire on it and it is capable of getting the free spins started with just two of them being present. They have to be on the 1st and the 5th reels, in the same round, and if that happens you get 15 free spins out of it. The slot’s free spins come with 2x multipliers, which will double any prizes obtained along the way. 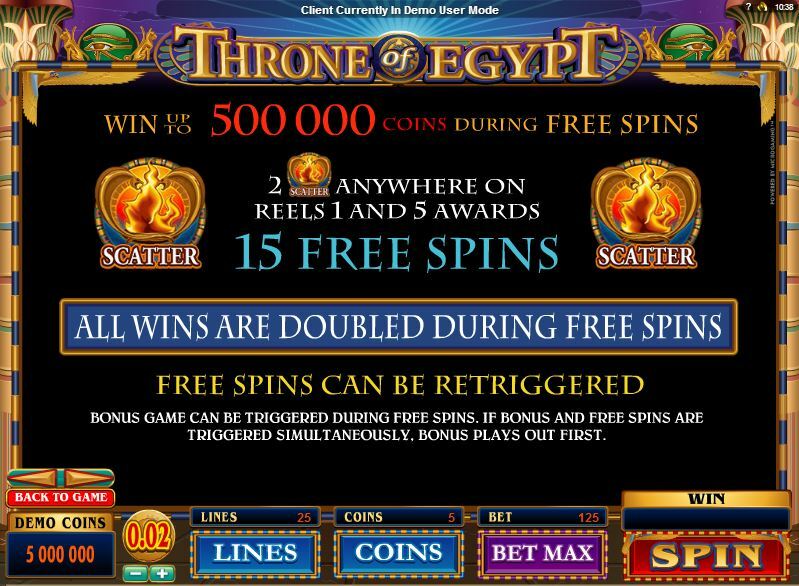 You can also retrigger free spins, provided that you got the two scattered Fire symbols again. The bonus game has its own scatter symbol that can trigger it. Two things will happen with its help. 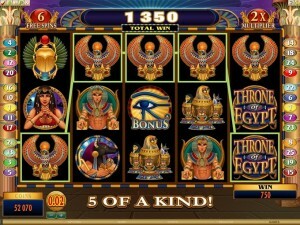 With two or three symbols with the Eye of Ra, you get a prize worth 1x or 3x the bet. With three symbols, you also get into the bonus game, called Bonus Chamber. The three symbols need to be scattered on the 2nd, 3rd and 4th reels. 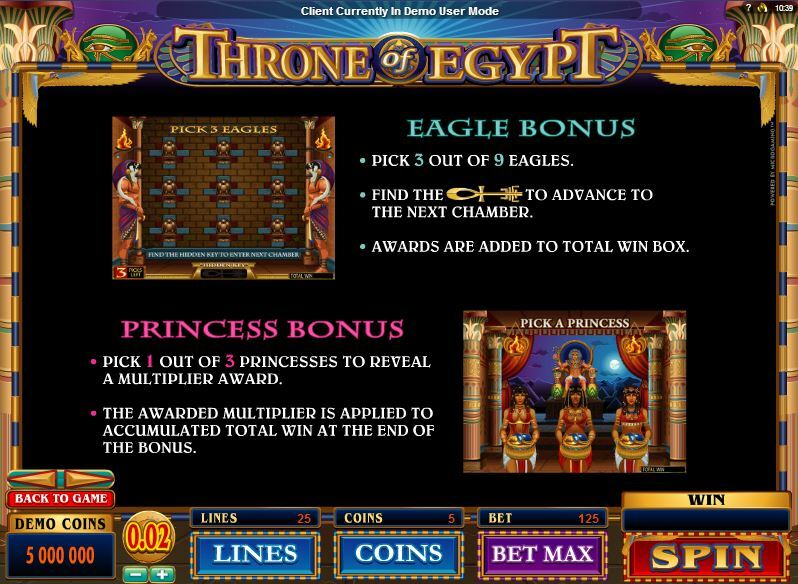 The bonus game has three levels, called Scarab, Eagle and Princess. 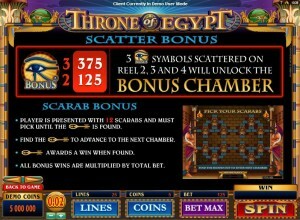 Scarab is the first level of the bonus game. The chamber has 12 scarabs inside and you have to pick until you get the key which takes you to the next level. Eagle is the name of the second level, where you once again have to make picks. A total of 9 eagles are displayed and you have 3 picks to make. To advance to the next level, you need to once again find the key. In the Princess level, you are taken to the throne room. 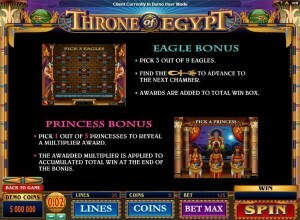 The Pharaoh sits on the throne in the back, while in front of you there are three princesses. You pick one of them, and you are awarded a multiplier which is used on all the prizes obtained up to that point. 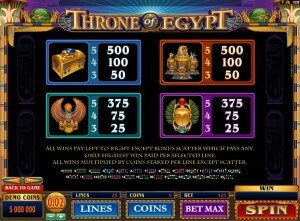 The line bet will only go as high as $1 in Throne of Egypt. You are allowed to use between 1 and 5 coins, and you can pick a denomination in the $0.01 to $0.20 range. The maximum bet uses 125 coins and is worth $25. The biggest reward that the paytable mentions is at 10,000x, meaning a maximum of 50,000 coins. That might mean only $10,000, but since it’s offered by a stacked symbol you get the chance to win multiple jackpots in the same round. I’ve mentioned it before, the design in Throne of Egypt is one of the best things about it. 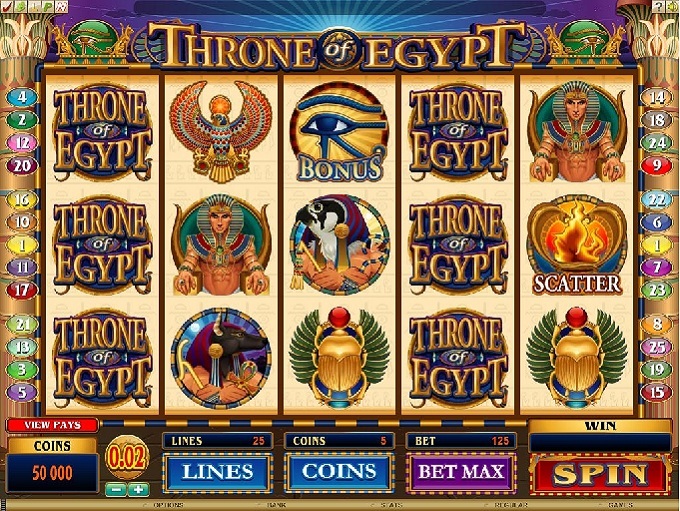 It looks like a true modern slot machine, not just one member in the legions of Egyptian themed titles already out there. It’s a pleasure to play on it, with symbols all being themed and very well fleshed out by the designers. Two well decorated columns are visible on the sides, instead of the more typical decorated wall that is used in other titles. Symbols: Throne of Egypt Logo (wild, 10,000x), Fire (scatter), Eye of Ra (scatter, 3x bet), Pharaoh (5,000x), Princess (2,500x), Horus (1,250x), Anubis (750x), Treasure Chest (500x), Canopic Jars (500x), Ra (375x) and Scarab (375x). 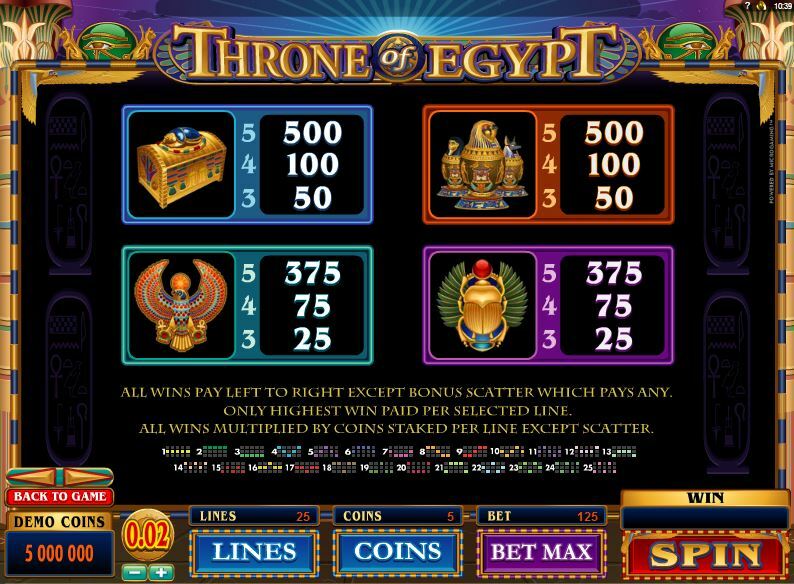 If you want to play a game with this particular theme, you will find that you have a lot of options, but not that many do as well in every area as Throne of Egypt does. I recommend it to any fan of the Egyptian genre. 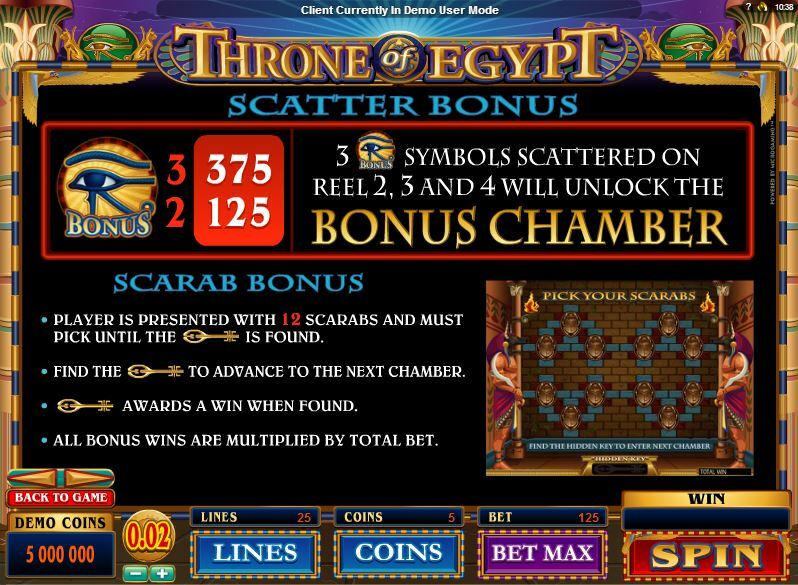 The Throne of Egypt slot machine is offered through the Microgaming platform, so if you want to play it for real or just to practice, look out for casinos that use it.